Atheneum/Caitlyn Dlouhy Books, 9781481438254, 320pp. another victim or perpetrator in the chain of violence that took his brother’s life. dramatic effect; the last of these reveals the best closing line of a novel this season. perfect if daring choice for readers’ theater. Spanning a mere one minute and seven seconds, Reynolds’ new free-verse novel is an intense snapshot of the chain reaction caused by pulling a trigger. First, 15-year-old Will Holloman sets the scene by relating his brother’s, Shawn’s, murder two days prior—gunned down while buying soap for their mother. Next, he lays out The Rules: don’t cry, don’t snitch, always get revenge. Now that the reader is up to speed, Will tucks Shawn’s gun into his waistband and steps into an elevator, steeled to execute rule number three and shoot his brother’s killer. Yet, the simple seven-floor descent becomes a revelatory trip. At each floor, the doors open to admit someone killed by the same cycle of violence that Will’s about to enter. He’s properly freaked out, but as the seconds tick by and floors count down, each new occupant drops some knowledge and pushes Will to examine his plans for that gun. Reynolds’ concise verses echo like shots against the white space of the page, their impact resounding. He peels back the individual stories that led to this moment in the elevator and exposes a culture inured to violence because poverty, gang life, or injustice has left them with no other option. In this all too real portrait of survival, Reynolds goes toe-to-toe with where, or even if, love and choice are allowed to exist. HIGH-DEMAND BACKSTORY: A noisy buzz always surrounds this critically acclaimed author’s work, and the planned tour and promo campaign will boost this book’s to a siren call. Will, 15, is following his neighborhood’s well-established rules—don’t cry, don’t snitch, but do get revenge “if someone you love/ gets killed”—when he leaves his apartment, intent on killing whoever murdered his older brother, Shawn. He’s emboldened by the gun tucked into his waistband: “I put my hand behind my back/ felt the imprint/ of the piece, like/ another piece/ of me/ an extra vertebra,/ some more/ backbone.” As Will makes his way to the ground floor of his building, the elevator stops to accept passengers, each an important figure from his past, all victims of gun violence. Are these ghosts? Or is it Will’s subconscious at work, forcing him to think about what he intends to do and what it will accomplish? The story unfolds in the time it takes for the elevator to descend, and it ends with a two-word question that hits like a punch to the gut. Written entirely in spare verse, this is a tour de force from a writer who continues to demonstrate his skill as an exceptionally perceptive chronicler of what it means to be a black teen in America. The newest work for teens by Jason Reynolds (author of As Brave As You and Ghost, and 2017 Indies First spokesperson) begins with 15-year-old William speaking directly to the reader: "I haven't/ told nobody the story/ I'm about to tell you./ And truth is, you probably ain't/ gon' believe it either/ gon' think I'm lying/ or I'm losing it,/ but I'm telling you,/ this story is true." The day before yesterday, Will's older brother, Shawn, went to the other side of their largely black neighborhood--purportedly crossing rival lines--to get their mother special soap for her eczema. Shortly after Shawn left, Will and his friend, who were talking outside, heard shots. They immediately did what they had been trained to do: "Pressed our lips to the/ pavement and prayed/ the boom, followed by/ the buzz of a bullet,/ ain't meet us." Afterward, Will says, "me and Tony/ waited like we always do,/ for the rumble to stop,/ before picking our heads up/ and poking our heads out/ to count the bodies./ This time/ there was only one": Shawn. "[I]f the blood/ inside you," Will tells the reader, "is on the inside/ of someone else/ you never want to/ see it on the outside of/ them." Now, two days later, Will is heartbroken and desperate as he abides by "The Rules" he's been taught all of his life; he won't cry and he won't snitch. And, most importantly, he plans to follow through with the third rule: "if someone you love/ gets killed,/ find the person/ who killed/ them and/ kill them." He finds a gun in Shawn's dresser--one bullet under a full clip--and sets off to kill the person who killed his brother. With the gun tucked into the waistband of his pants, Will gets on the elevator at 9:08:02 a.m. The next 200-plus pages of action take place between the time Will enters the elevator and when it reaches the lobby a moment later, at 9:09:09 a.m. As Will takes the long trip down, a new person boards at every floor. Each new person is a friend or loved one from Will's past; each new person is dead, a victim of gun violence. As the ghosts of those killed congregate in the elevator to tell Will their stories, their interconnected tales are untangled and Will begins to see how the things he thinks he knows may not be true at all, and that The Rules just perpetuate the cycle of violence and keep everyone down. 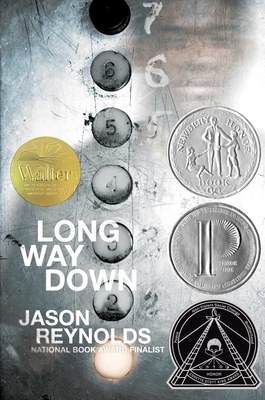 Shelf Talker: Will is visited by the ghosts of victims of gun violence as he prepares to kill someone himself in Jason Reynolds's thoughtful and captivating Long Way Down. In this free-verse novel, it’s been fewer than two days since narrator Will witnessed the shooting death of his older brother, Shawn. Now, according to the “rules” passed from father to son, brother to brother, revenge is the next order of business, and Carlon Riggs, a member of the Dark Suns gang, is in Will’s crosshairs. Taking the gun jammed into Shawn’s dresser, Will heads to the elevator on the seventh floor of his apartment building and presses the “L” button (which he and Shawn used to pretend stood for “loser” rather than “lobby”) at 9:08:02 am. Before he reaches the lobby at 9:09:09, six ghosts will enter the elevator—victims, perpetrators, or both, entangled in a chain of murder, misidentification, and revenge that led to Shawn’s death; together they challenge Will’s perspective on the killing and on his role in vigilante justice. The ghosts all know one another as confederates in death, and all history that might have once made them enemies is now overshadowed by their detachment from mortal issues; they can share cigarettes and a mildly sardonic view of the absurdity of their collective backstory. The spirits, particularly Will’s uncle, father, and brother, have Will’s interest at heart; they won’t tell Will what to do, but they break through his anger and pride and point him to a place where he can allow himself to grieve and reconsider. Will’s voice emerges through free-verse poems that are arresting in their imagery and convincing in their conversational cadence. Gripping and lightning fast, this will be a strong recommendation for discussion, particularly within groups of varied reading interests and abilities.